Great music video. I think Fogarty was a Nam veteran if my memory is correct. Trademark law is based on use. When use ends, trademark rights extinguish. No doubt that’s what happened with the Olympics mark which fell out of use for these goods/service until the modern revival. At that point no one owned the rights to the mark. And at that point it was fair game for a subsequent owner to adopt. 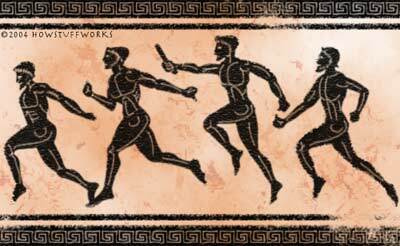 Did I miss that the Olympics have been around for 8k years? No, How can someone license and regulate what they do not own, other than hooking? Now, get down on all four and bark. You heard your master. Under the U.S. Amateur Sports Act of 1978, the committee has exclusive rights to the name in the U.S. This case has little to do with traditional trademark law. The USOC has a special statute conferring all the rights in the mark OLYMPICS and even has a statutory remedy. And a quick search of the Trademark Office’s database reveals hundreds of OLYMPIC marks, most likely for different goods/services and/or diferent channels of trade. I’ll probably follow the coverage of the case closer than the coverage of either Olympics. The Red Neck’s lawyer probably won’t have much fun in this case. HEBRON, Maine – The Maine organizer of the “Redneck Olympics” says he’s being warned by the U.S. Olympic Committee to drop the word “Olympics” from the name. Redneck Olympics organizer Harold Brooks says he received a telephone call Monday from an official at the USOC warning him to change the name of his event or face a lawsuit. Brooks says he was told the word “Olympics” is the property of the USOC. He says the word has been around for 8,000 years and he’s referring to the old word. My question is, did the US Congress authorize this act of the USOC? If not, my understanding of American History is that it only dates back to 1776. How in the hell can you claim ownership that is rightfully a Greek tradition and is about 7,750 years older than the one claiming ownership? Oh yes, this is the American way. Do we have any copyright/trademark attorneys that post on this blog? Here is to memories of the best of times and the worst of times. We were young and full of spirit, but there was a war on. Hell of a thing to remember when you are old. I do remember the CCR row. They were one of my favorite groups in College. Great old clip of CTA! I recall the reason the entertainer, Prince, resorted to a mystical symbol for his “name” and was introduced as, “The entertainer formerly known as Prince,” was due to a dispute with his record label over who owned the name, “Prince.” He resumed use of his name after the dispute was settled. And don’t forget that they (the Olympic Committee) successfully sued the Gay Olympics forcing them to change their name to the Gay Games. The suit was represented by Vaughn Walker… yep, the same guy who would later be the (gay) Judge who presided over the recent Prop 8 case in California. It is interesting to note that the Olympics authorizes the use of the word for the Specials Olympics. These assholes sued the “Olympics Of the Mind” people forcing them to change their name a few years back. It was a profitless organization designed to create competition between school age kids to foster creative thinking and problem solving. It was in no way a threat nor would it in any way affect the actual Olympics but that did not seem to matter. Besides being greedy, bribe-taking misanthropes they proved they are not really interested in bettering humanity. The Corporate counsel of Olympic Paints and Stains should start preparations to defend their name in court. And what about the Olympic Peninsula and Olympic National Park in Washington state? I am even more interested in that redneck decathalon event of drinking ten kegs of beer while screaming at your kids and watching WWE wrestling on TV. If the USOC claim of copyright ownership to “olympics” is arguably valid, what does that say about other groups presently using the word. Special Olympics certainly comes to mind. And if they can challenge such an historically-recognized word, can they also challenge similar and variant words? How about Olympia, Washington? Will the USOC go after other targets? I can imagine the Redneck Olympics might receive a little less sympathy than Special Olympics. It has been a really long time ago and I may have this a bit garbled. If memory serves correctly, when zoom lenses were first invented somebody tried to patent the laws of physics that made such lenses work. The attempt to patent a law of physics was rejected. Of course they do and I own the trademark “Redneck”….